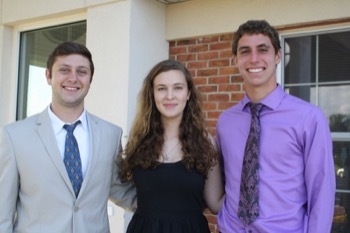 Jack Kelly, now a student at MIT with a double major in aeronautical and astronautical engineering, Brenna Gause, a musical theater major at NYU and Anthony Caruso, studying pre-med at the University of Delaware, credit the foundation they received at The Jefferson School with their success in college. CLICK THE PHOTO to hear an interview Anthony, Breanna and Jack did for "Delmarva Live." TJS IS A GREAT SCHOOL, BUT IT'S SMALL. WILL MY CHILD BE ADEQUATELY PREPARED ACADEMICALLY AND SOCIALLY GOING FROM 8TH GRADE AT TJS INTO A MUCH LARGER HIGH SCHOOL? 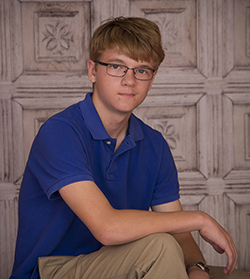 We recently sat down with Ian Lisle, a 2016 TJS graduate and now a freshman and honor roll student at Sussex Academy. He told us that even though the classes sizes were three times larger, he felt comfortable in his new school from day one. "My algebra teacher was amazed at how quickly I fit it in. In fact, he thought I had been a SA middle schooler." He explains, "Being at TJS through eighth grade taught me how to interact comfortably with adults as well as classmates. I also developed confidence speaking in public. "I felt well-prepared for all my new classes." In fact, Ian feels that coming from a smaller school was a definite advantage because TJS places such an emphasis on group work and provides more 1:1 time with teachers. "A big plus for me was all the hands-on science at TJS. Ms. Jenn's classes did a lot more nature and earth science using the campus, a big advantage for me because so many of my SA classmates never went outside for science. I love the high school lab environment and completely felt ready for it." Jefferson School students move on to high school and college fully prepared for academic success in a variety of challenging public, private and charter school settings. Like Ian, many graduates come back to visit and are eager to discuss how well prepared they are. Students confidently make smooth transitions into both the secondary and post-secondary phases of their academic careers. Three of our alums, all members of the Class of 2010, discussed their TJS experience as the foundation of their preparation for college on Delmarva Live. Click the sidebar on the left to watch the interview.